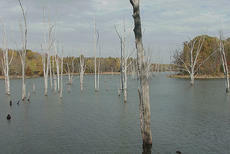 Big Oaks National Wildlife Refuge in southeastern Indiana recently opened to public use. It’s an old military testing ground facility now benefiting wildlife. For the public, Big Oaks offers hunting, fishing, bird-watching and more. An area in the northeast section of the refuge is available for public day use, and additional acreage around the facility is open during hunting seasons. Mother’s Day is a special day. It is a time to remember and honor Mom. There’s the traditional flowers and candy, or a trip to the restaurant for Mom, but how about giving her an outing, a trip to a state park, or even a fishing trip? Many moms enjoy fishing, and if fishing really isn’t something they like, most would enjoy a day outdoors. In many cases, it was Mom who helped introduce me to the outdoors, and often today in single-parent families it is Mom who is teaching youngsters to hunt, fish, or otherwise enjoy nature. Eric had tagged out on his second turkey on Saturday, April 27, and decided to go with me on Sunday morning. We left the house at 4:50 a.m. going to Hart County. To make a long story short, after a lot of walking and hard work, we finally got into a good set-up with three gobblers coming in and I MISSED. Both of us were tired, but I was really frustrated with myself for blowing a fairly easy shot. This was my seventh hunt of the season and only my second encounter with a gobbler. Oh well, I was getting a lot of exercise and still had one more week to hunt. Friday evening, as Eric and I were planning our turkey hunt for the morning of Saturday, the 27th, I decided to hunt here in Nelson County, mainly so I could sleep late. I wouldn’t have to get up until 5.30 a.m.
Eric, after thinking back on past hunts, decided to hunt our farm near Munfordville partly because this would be the same field that he had taken his grandpa on his first turkey hunt, and at the age of 73 my dad had taken his first gobbler. Every spring brings with it rain, and this year has been no exception. In fact, for many there has been too much rain to really enjoy the season’s fishing. Hopefully, flooding has passed. But if we get river waters back over the fields, it can be a time to catch catfish. There’s no better place to catch a stringer of fish on some spring days than in a cornfield. 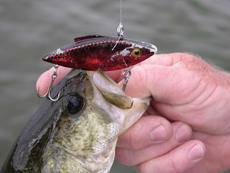 The fishing action can be hectic at times, and an angler can put a lot of fish on the stringer. Sounds a little crazy, but true. Conditions have to be just right. I slipped out of bed at 5:15 a.m. and started getting dressed and ready to meet Eric for the second morning of the spring turkey season. Before I left the house I wrote Bonnie a note wishing her a happy anniversary and that I would be home in a few hours. When we had planned our wedding 41 years ago, there were no turkeys in Kentucky. At that time we had no idea that our anniversary would usually fall on opening weekend of turkey season or that I would have such a passion for turkey hunting. Lipless crankbaits have always been a popular and productive lure for catching bass, and some crappie anglers even use them to land big crappie. While fishing for crappie a few years back at Kentucky Lake, some of us were finding the fish uncooperative, but a couple of Crappiemaster tourney anglers headed out to use Rat-L-Traps for crappie. By far, they had the best success of the day. Todd Faircloth, fishing pro sponsored by Yamaha, recently was interviewed related to his use of lipless crankbaits, and their special value during spring fishing. With turkey season opening the morning of April 13, I got all my gear together, then watched the NASCAR Nationwide race until 11:30 p.m. before going to bed. Eric was going to pick me up at 6 a.m., but I woke up at 3:30 a.m., and after all these years was excited enough about opening day that I couldn’t go back to sleep. I had no trouble at all being ready when Eric arrived. After a long, cold winter, turkey season has arrived, and there should be plenty of birds for good hunting this spring. Kentucky’s season opened last Saturday and continues through May 5. The good news for hunters is that Kentucky’s turkey flock numbers about a quarter million birds. If you are like me and have forgotten about or waited on applying for your elk permit, time is running out. We have until April 30 to get our applications in and it has to be done online at fw.ky.gov. Each application costs $10, and you may apply for up to two of the four tag types. Tag choices include bull firearms, bull archery or crossbow, cow firearms, and cow archery or crossbow. Again, you can apply twice but your choices have to be for different tag types.